The issue of homelessness among U.S. Military Veterans is one that has been getting much attention over the past decade, with much discussion about the causes, effect, and solutions to this problem. However, there has been very little governmental or institutional progress toward a satisfactory resolution. It is a tragedy that by some estimates, at least 30% of the homeless population in this country are Veterans. Brevard County has not been spared the problem of homelessness and the Vietnam And All Veterans of Brevard, Inc. has taken specific action to assist in helping these homeless vets. The Vietnam and All Veterans of Brevard is a not for profit organization incorporated under the laws of the state of Florida. Its purpose is to promote veteran's affairs, give service to the community, and to provide assistance to those veterans who have temporarily lost the ability to manage their lives successfully. Since it's founding in 1985 the VVB has been actively engaged in veterans' assistance activities and has established a reputation as a dynamic and purposeful organization. The Veterans Transitional Facility is a temporary shelter for homeless veterans with their immediate families. The purpose of the Facility is to provide for the immediate needs of homeless veterans while permitting them to search for work, and once employed, to save enough money to acquire living quarters and transportation The Facility consists of ten apartments housed in two buildings which can accommodate up to nineteen residents. In addition to the living areas there is a dayroom, a commercial kitchen for preparing meals, and a storeroom for storing food and other supplies. Be a Veteran or the immediate family with a Veteran and be able to prove it. Be indigent or be able to demonstrate a valid need for assistance. Be able to care for one's own personal needs. The Facility is staffed by a Director/Case Manager, Resident Facility Manager, and a part-time cook to prepare meals for the residents. These personnel are supervised by the Veterans Assistance Program Committee of the Vietnam and All Veterans of Brevard, Inc. Residents are provided with all personal items including clothing, if that is necessary. During their stay at the facility they are required to search for work and to obtain employment within a reasonable length of time. They are also required to assist in maintaining the Facility. Apartments are inspected regularly to insure that residents maintain a reasonable living standard. The Facility maintains contact with Florida Job Link and local businesses in an effort to assist residents in finding employment. Residents with substance abuse problems are required to participate in AA meetings and also in counseling sessions provided by a Veterans Administration counselor. Residents who need other social services are referred to the proper agency within the county. Residents needing health treatment are transported to the Brevard Veterans Administration Outpatient Clinic at Viera or to the Orlando Veterans Administration Clinic. Residents who must apply to the Veterans Administration for disabilities or pensions are referred to the Brevard County Veteran's Service Office or to one of the many veterans’ organizations who maintain service officers within their organizations. "Residents live at the Facility in a controlled environment"
The current cost for maintaining the Facility is about $90,000.00 per year. Funding sources includes participation in the Veterans Administration "Grant and Per Diem" program & grants and donations from corporations and small businesses, and donations of monetary and material through private individuals. 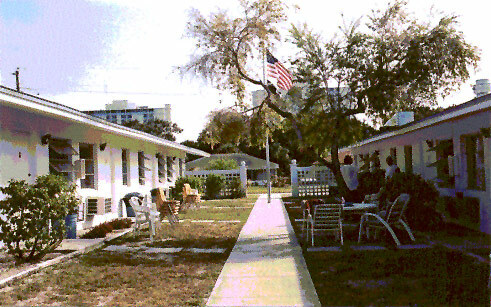 During our years of operation we have received funding through many sources to include: the Florida Department of Children and Families, funding through the Brevard County Community Development Block Grant and Community Based Organizations programs, funding through the City of Melbourne Community Development Block Grant Programs, Agent Orange Class Assistance Program. Support is needed to continue this worthwhile program. We have shown that there is a need in the community to provide veterans and their accompanying families a program such as this and with your support it will continue. Any organization wishing to donate money, material, food, or services is welcome. The Vietnam and All Veterans of Brevard have operated a Veterans Residential Facility since 1989. More than 2000 veterans and their families have benefited from this program since its beginning. We own the facility where our current program is housed and in partnership with state, county, and city government, with veterans organizations, civic organizations, businesses and corporations, and with our individual comrades-in-arms and other supporters it is our intention to continue to operate this worthwhile program to assist veterans and their family members who are less fortunate than we.